Is it possible to go on Tanzania safaris with Kids/Children? Arusha National Park is a popular Tanzania wildlife safari destination. Arusha National Park is popular for game drives and less populated because of the less wildlife in the park compared to the northern circuit parks of Serengeti National Park and Ngorongoro conservation Area. This makes it an ideal walking safari in Tanzania destination and you can go for the walk with the family. Along with the kids after having a walking safari, you continue to the park for a canoe experience to the Momella Lakes. Here you can go canoeing in two-person open canoes, gliding across the smooth waters of the lake in search of hippo and abundant bird life. Antelope rest in the shade on the banks of the lake and warthog scuttle around. Many travelers understand only wildlife safaris in Tanzania but then the best way of understanding the people is getting so close in one way by visiting the markets. Visit a local market with the kids and decide to buy either fresh fruits or crafts. There could be more wooden carvings than the thousands of wildebeest in Tanzania and if you need to get a piece, just get into one of the markets and have a variety to choose from. If you thought the bushmen don’t exist anymore in the 21st century, then you are wrong. In Tanzania there still the hadzabe bushmen living in the remote area around Lake Eyasi, near the Ngorongoro Crater. 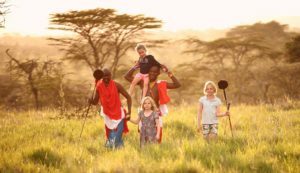 Once you have located a group you have the unique opportunity to experience traditional bushman life, a real highlight of any Tanzania safaris with kids. During this experience, you can learn how to light fire by rubbing sticks, practicing firing a bow and arrow at a grass target, causing much hilarity with the local boys who will then demonstrate their shooting skills! You may even be invited to join the bushmen on a hunt in the bush in the search for small wild animals – usually rabbits, squirrels or birds. You can spend a wonderful morning cycling along quiet tracks through the banana plantations that surround Mto Wa Mbu. Situated on the edge of the Rift Valley Escarpment, the countryside here is very picturesque, the banana palms lush and green against the backdrop of the rocky escarpment. You cycle to how far you want to go. One of the best places to stay in Tanzania with kids is a wonderful tented camp near Tarangire National Park, which features probably the best pool in the area. Situated on a raised deck above the plains of the Lake Burunge Conservation Area, there are herds of wildebeest and zebra passing just a few meters away. Perch on the edge of the pool and watch ostrich amble past, or warthog snuffle in the dirt. Sundowner drinks are served on the deck by the pool at dusk so the kids can swim, you can have a drink as you enjoy the sunset, and the wildlife just keeps on coming. 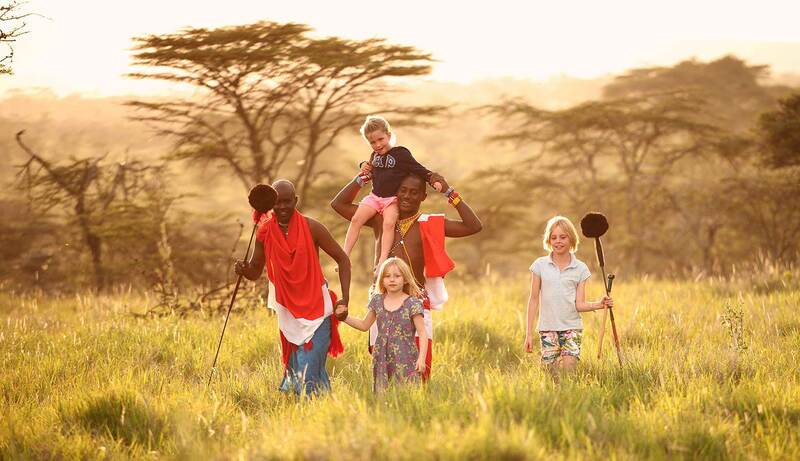 Safari Tanzania with your Kids and have just the most out of the African experience with the whole family. Travelling with kids can be to any preferred destination, it could be for a safari in Kenya, Uganda safari or Rwanda safari, you just need to know of what the kids can do in the different countries.